During the 16th Century there were further attempts to contain the spread of football. 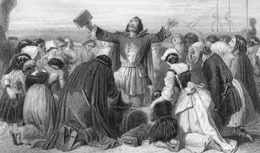 The Puritan movement during the reign of Elizabeth I (1533-1608) took up the cause against football. They believed that ‘frivolous amusements’ were time wasting exercises and inherently evil. One Puritan leader, Philip Stubbes wrote extensively about such evils. He con stantly criticized the theatre and acting in general. Comments he made regarding acting are still too obscene to print here! His other favourite subject was football. One particular issue was that football was played on Sundays – the Sabbath and day of rest. In his book ‘The Anatomie of Abuses’ (1583) he severely attacked both these areas of entertainment. As concerning football playing, I protest unto you that it might rather be called a friendly kinde of fight than a play or a recreation; a bloody and murthering practise, than a felowly sporte or pastime. For dooth not every one lye in waight for his adversarie, seeking to overthrowe him, and to picke [pitch] him on his nose, though it be upon hard stones? In ditch or dale, in valley or hil, or what place soever it be, hee careth not, so he can have him down. And he that can serve the most of this fashion, he is counted the only fellow; and who but he? So that by this means, sometimes their necks are broken, sometimes their backs, sometime their legs, sometime their armes; sometime one part thrust out of joynt, sometime another; sometime the noses gush out with blood, sometime their eyes start out, and sometimes hurt in one place, sometimes in another. But whosoever scapeth away the best, goeth not scot free, but is either sore wounded, craised, and bruseed, so as he dyeth of it, or else scapeth very hardly. And no mervaile, for they have the sleights to meet one betwixt two, to dashe him against the hart with their elbowes, to hit him under the short ribbes with their griped fists and with their knees to catch him upon the hip, and to pick him on his neck, with a hundred such murdering devices; and hereof groweth envy, malice, rancour, choler, hatred, displeasure, enmite, and what not els: and sometimes fighting, brawling, contention, quarrel-picking, murther, homicide, and great effusion of blood, as experience daly teacheth. Is this murthering play, now, an exercise for the Sabath day? is this a Christian dealing, for one brother to mayme and hurt another, and that upon prepensed malice or set purpose? is this to do to another as we would wish another to doo to us? God make us more careful over the bodyes of our brethren!